Welcome to my very first blog! I hope you will be patient and keep following me as you watch me learn more about blogging and the hi tech world that I know so little about at present. I get that my blog at this point is very…rudimentary…but I hope that doesn’t keep you from enjoying the cards and paper creations that I post. I hope my posts will inspire you to explore creativity in the wonderful world of paper crafting! 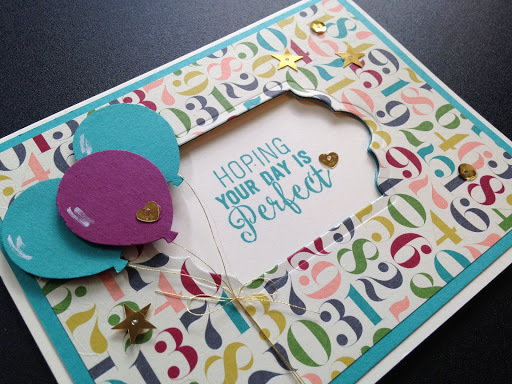 I challenged myself to make some birthday cards with the Balloon Bouquet Punch but without it’s companion photopolymer stamp set; Balloon Celebration. Okay, time for a confession…for some strange reason, I thought I didn’t want the stamp set! I thought the punch would be enough for me! Yikes, my mistake, I do want the stamp set after all..no real surprise there! Too late to get the bundle, but that’s okay. 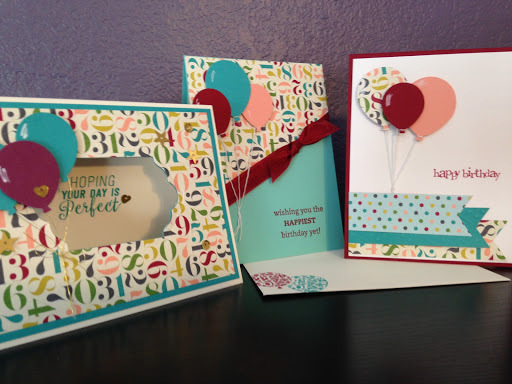 As you can see, cute cards can be made with just the punch…but just think how much more fun it will be to have the stamp set too! Have you ever done that, only bought half of the bundle? Sigh…we live and learn. This is an older Stampin’ Up! Designer Series Paper, DSP, I can’t remember which catalog it came from, but it’s super cute. For a boy or a girl, a kid or an adult. I just love the Bermuda Bay!